The Simms G3 Guide Gore-Tex Fly-Fishing Pant Wader for Men is an extremely advanced Gore-Tex fly-fishing pant wader for men that is made with 4 layer Pro Shell Gore-Tex fabric that is waterproof, breathable and windproof and are not as restrictive as chest waders and provides much better comfort and breathability and is also very durable that makes these fly-fishing wader for men very innovative. These wading pants have a new fit that wears more like jeans. 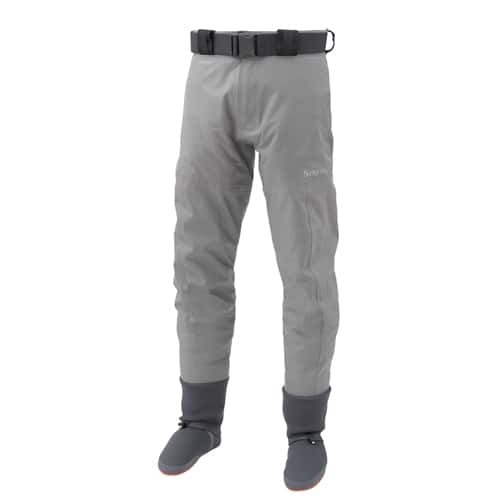 The Simms G3 Guide Gore-Tex Fly-Fishing Pant Wader for Men comes with an abrasion-resistant, durable built-in gravel guards as well as a double snap closure at front waistband with a TIZIP waterproof fly zipper along with patented front and back leg seams. The Simms G3 Guide Gore-Tex Fly-Fishing Pant Wader for Men is also designed with a waistband construction with integrated belt loops and also features a high quality 2 inch stretch neoprene belt and also comes included with a flip-out Tippet Tender pocket with a patented built-in Retractor as well as a Super-fly Patch, so make sure to check out this Simms G3 Guide Gore-Tex Fly-Fishing Pant Wader for Men now. Why is the Simms G3 Guide Pant Wader the right choice for you? The Simms G3 Guide Pant Wader features the scientifically enhanced Gore-Tex fabric, which, alone, should be all the reason you need to use this guide pant wader. The famous Gore-Tex fabric is waterproof, breathable, and completely windproof, all which are extremely important to all fly-fisherman. These pant waders will not be as restrictive as chest waders, and when you don't need the advantages of chest waders, then these pant waders will provide you with added comfort and breathability. So when choosing a pant wader for your next fly-fishing adventure, pick the Simms G3 Guide Pant Wader.